PA's UN envoy says he's dropping bid to become full member state due to "obstacles". The Palestinian Authority (PA) is dropping its bid to become a full member of the UN, its UN envoy said Monday, according to The Associated Press. The envoy, Riyad Mansour, told reporters that the day will come when "obstacles" in the Security Council to full UN membership for “Palestine” will be removed "but that day is not today." The main hurdle is the United States which would more than likely veto any Security Council resolution granting the PA full membership of the global body. The US says the only way PA can gain full membership at the UN is by negotiating a peace deal with Israel. "We disagree with them on that. We believe that our statehood, and our admission, is an innate right for the Palestinian people ... to exercise it alone. It is not open for negotiation with anyone - nor will we ask for permission from anyone," said Mansour, according to AP. 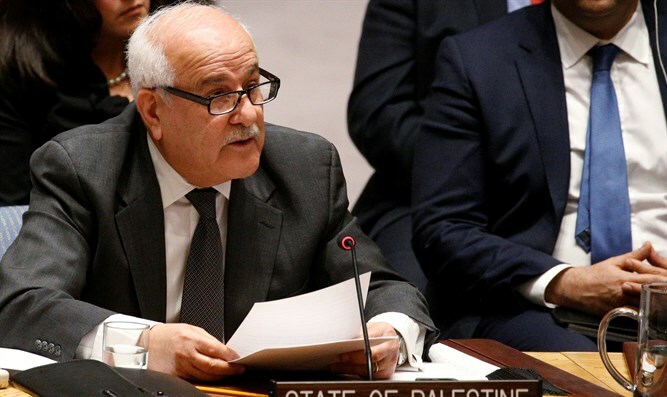 Mansour said the legal right for “Palestine” to be a full member of the United Nations was formalized in the 1947 General Assembly resolution that partitioned British-ruled Palestine into "independent Arab and Jewish states." Israel was accepted as a UN member, he said, and “Palestine will continue fighting for that right." Mansour’s comments come two weeks after the PA announced it would launch a bid to become a full member of the United Nations. Full membership would amount to international recognition of Palestinian statehood. The PA’s latest bid to become a full UN member came as it assumed chairmanship of the Group of 77 bloc of developing countries at the UN. In October, the United Nations General Assembly voted in favor of allowing the PA to chair the group in 2019, thus allowing the PA to act more like a full UN member state during meetings in 2019. Mansour stressed that "negotiation is different than expressions of self-determination." He noted that America's 13 colonies didn't negotiate with England in 1776 when they declared independence, and Israel didn't negotiate its independence declaration in 1948. Since then, Mansour said, "we have negotiated, and we could possibly, if the conditions are right." Relating to the possibility of renewed talks with Israel, Mansour said if Jerusalem and Palestinian refugees are off the table, and settlements are "more or less off the table, what is there left to negotiate?"